There was once a bird called Hawthorn, who loved to flutter about near the electrical cables that exist in lots of towns. In particular he liked to be near the lamp posts, because it was nice and warm there and the birds had somewhere to perch. On the cables there was a strange red object, which the birds called “Mr Red Heart“. This peculiar red heart was as round as a ball, and as red as a pepper. There were other red hearts scattered across the cable, which attracted the birds’ attention. Lucas was right about one thing: the red heart told the birds that there was a cable there so they wouldn’t fly into it, for the cable isn’t very visible in the air. In fact, humans call the red heart “bird guards“. In reality, the bird on the ground had been unlucky enough to touch two parts of the lamp post that were charged with electricity, and he had been electrocuted. Hawthorn was scared and worried, and began to believe Lucas’s story. So he asked Lucas how he should pay his respects to Mr Red Heart. Lucas pretended that he was Mr Red Heart’s agent, and told Hawthorn that he should pay Lucas 10 breadcrumbs every week. But clever Hawthorn began to be suspicious and realised that it was very strange that you had to pay Lucas just so as not to displease Mr Red Heart. So he decided to investigate how genuine this Mr Red Heart actually was. He asked the wisest birds in the area why the bird on the ground had died. 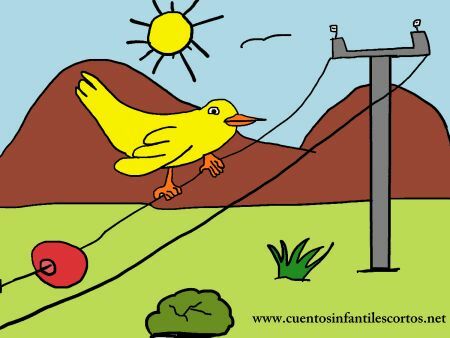 And the wise birds told him the truth: he had been electrocuted. So Hawthorn never trusted Lucas again, for he had discovered that Lucas had been trying to deceive him.